The baritone guitar has played a small but important role in music for decades, even though, for the vast majority of guitarists, it's never received quite the same level of adoration as its shorter-scaled cousin. Nevertheless, it's easy to find standout examples of the baritone in genres as diverse as country, jazz, metal and more. Many recording studios keep a baritone on hand, where it's used — more often than you'd think — to fill out and embellish recordings. In fact, once your ear is familiar with the instrument's sound, you may be surprised to discover just how many recordings the baritone guitar appears on. It's a versatile instrument, too. When played in the first position and up to the third fret, baritone guitars produce the classic tone they’re known for. But when played above that, some of the brashness tempers, and they sounds closer to a regular electric guitar, only fatter. There's a whole spectrum of tones you can create with the baritone, which explains their popularity in the studio setting. So, why do you need a baritone guitar? Check out some of the instrument's finest recorded moments below to find out. The rocking instrumentals of Duane Eddy, one of the earliest adopters of the baritone, stormed the airwaves in the late Fifties. 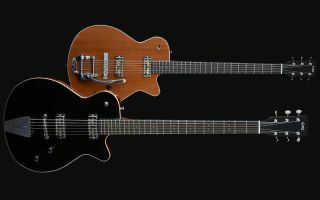 The King of Twang's penchant for baritones exists to this day; earlier this year Gretsch unveiled the G6120TB-DE Duane Eddy Signature model (billed as a six-string bass). The Beach Boys, "Dance, Dance, Dance"
Brian Wilson incorporated baritone guitars into many of the Beach Boys’ recordings, and there's no mistaking the instrument heard right at the top of the group's 1964 hit, "Dance, Dance, Dance." The technique known as tic-tac bass — doubling a bass line with a muted baritone guitar — was used frequently in Nashville recording sessions in the Fifties and Sixties. There are plenty of examples, but it can be easily heard on Patsy Cline's classic cut, "Crazy." Shifting gears to acoustic guitar, fingerstyle player Andy McKee uses a custom Greenfield baritone to create the sublime tones heard on "Blue Liquid." Dave Matthews Band, "The Space Between"
Matthews might be one of modern rock's most visible baritone players, and 2001's "The Space Between" puts the instrument front and center. The guitarist-songwriter has played baritone on a handful of DMB songs, including another song you might know, "I Did It." Angelo Badalamenti's Twin Peaks theme centers on a haunting baritone guitar line that matches the dark, quirky tone of this cult television series. "Sad But True" — easily one of the heaviest riffs Metallica wrote for the Black Album — achieves its colossal tone thanks to an overdubbed baritone guitar played by James Hetfield. David Luning, "Brother In Chains"
Guitarist-songwriter David Luning performs with a Grez Guitars Mendocino Baritone, demonstrating the instrument’s sweet, chimey tones along with its familiar lower-register resonance. Opening up with an iconic surf-inspired baritone guitar line, the B-52s' "Rock Lobster" introduced the world to the band's retro new-wave sound. The Evens, "Cut from the Cloth"
It's rare that you'll find a guitarist who exclusively plays baritone, but in his band The Evens, former Fugazi and Minor Threat guitarist/singer Ian MacKaye does just that. And as a band without traditional guitar or bass, it's a solid choice. There's a misconception that baritones can't rip quite the same as standard guitars, but this Brian Setzer clip proves otherwise. The guitarist pulls off some serious high-register leads and string bends on this swinging live version of "Mystery Train."